Coach's Corner - Ed Ruscha signed "Christies" NFL artwork. 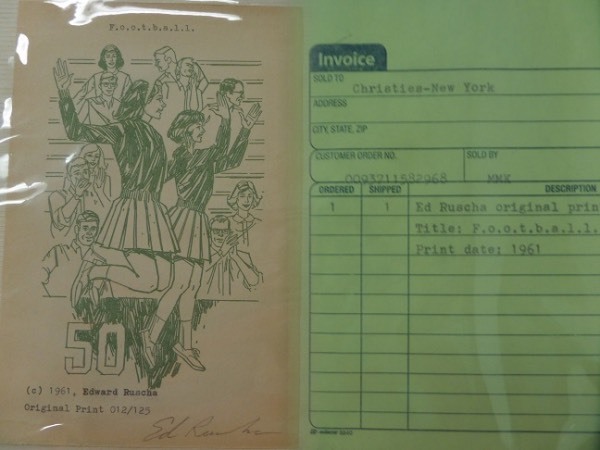 Go Back to Lot List Ed Ruscha signed "Christies" NFL artwork. This numbered limited edition is one of only 125 in the world and titled "Football". It is a 1961 work, comes numbered and dated, and pencil signed as well across the bottom. It has lots of green and tan color in it and sold for almost 3 GRAND at Christies Auction in 1977.